So it’s the end of another year, and I’m sure lots of you have glamorous plans… I’m not a wild party animal so will be having a relatively quiet one, but that has never stopped me pampering myself before. If you’re going out and want to relax before you get all glammed up, or like me, you’re beginning the chilled evening by… relaxing then this is my plan! It basically consists of a bath, a candle & a face mask. The fail-safe trio that is guaranteed to make you feel relaxed and ready for anything. 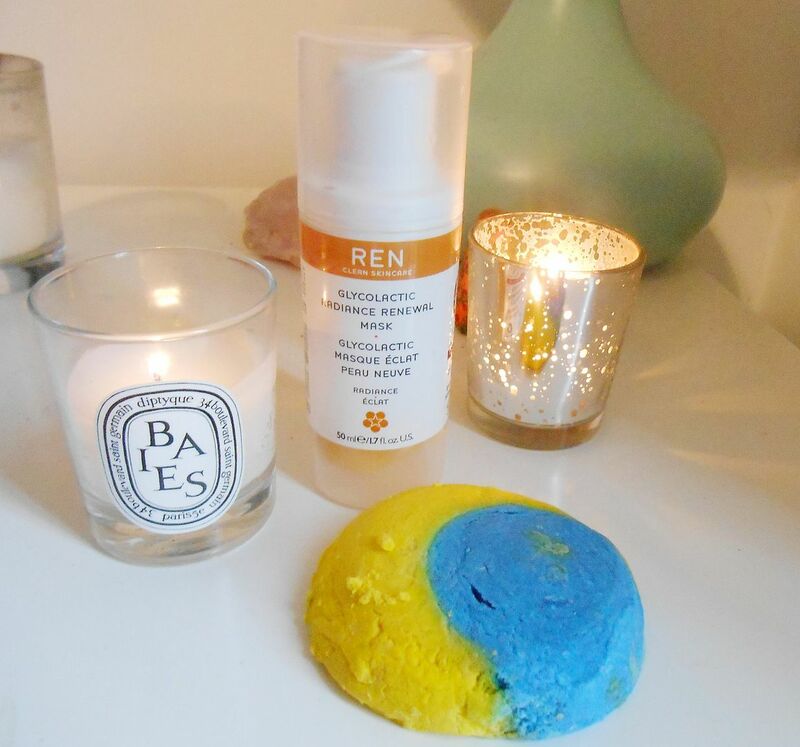 If you want radiant, fresh looking skin then I highly recommend the Ren Glycolactic radiance renewal mask. You smear the orange gel on your face, and wash off to reveal skin that looks and feels a lot nicer. It stings a little bit, but I like that because it means it’s working. Any mask will do, but one that promises radiance is good for me. For the bath I’ll be crumbling in some LUSH Christmas eve bubble bar. It’s sold out now for this year, but again any bath will do! I like this one because it’s really relaxing and soothing. Anything from LUSH will be delicious, really. I like to have a candle burning in the background, and the one I’m burning at the moment is Diptyque Baies. I like the floral and fresh scent, and I think a candle in the background is really relaxing. … So those are my top recommendations for a relaxing, pamper-iffic bath before any NYE plans! What will you be doing tonight?